The struggle to integrate the Baltimore Orioles mirrored the fight for civil rights. The Orioles debuted in 1954, the same year the Supreme Court struck down public school segregation. As Baltimore experienced demonstrations, white flight and a 1968 riot, team integration came slowly. Black players - mostly outfielders - made cameo appearances as white fans screamed racial epithets. The breakthrough came in 1966, with the arrival of a more enlightened owner, and African American superstar Frank Robinson. As more black players filled the roster, the Orioles dominated the American League from 1969 through much of the 1970s.<br /><br />Attempts to integrate the team's executive suite were less successful. While black players generally did not participate in civil rights actions, several under Robinson's leadership pushed for front office jobs for former black players. 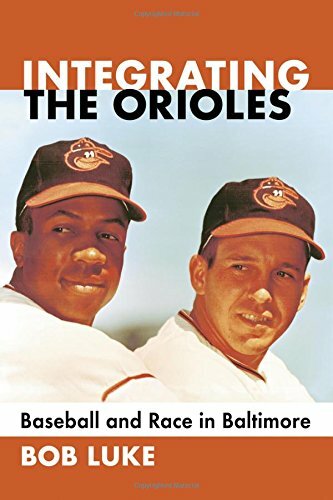 Drawing on primary sources and interviews with former executives, players and sportswriters, this book tells the story of the integration of the Orioles. The author describes how tensions between community leaders and team officials aborted negotiations to both increase black attendance and put an African American in the club's executive ranks. &quot;Well researched...[Luke] does an excellent job of weaving the histories of the city, the game and the Orioles organization&quot;--<i>Nine</i>; &quot;a compelling balanced narrative...impressive research...a wide array of interviews with former Orioles that prove invaluable to his story.... Those interested in the history of sport, race, and civil rights will benefit from Luke and those who follow in his example.&quot;--<i>U.S. Sport History</i>; &quot;Luke delivers a compelling, balanced narrative of how the Oriole organization and the city of Baltimore confronted race and segregation during the height of the modern black freedom struggle.... Those interested in the history of sport, race, and civil rights will benefit from Luke and those who follow his example.&quot;--<i>Sport in American History</i>.